The original 1885 Stanley prototype transformer at the Berkshire Museum. "the heart of the alternating current system"
What is a Transformer? A: A transformer is is a device that transfers electrical energy from one circuit to another through inductively coupled conductorsthe transformer's coils. How is it used? A: A transformer is used to bring voltage up or down in an AC electrical circuit. 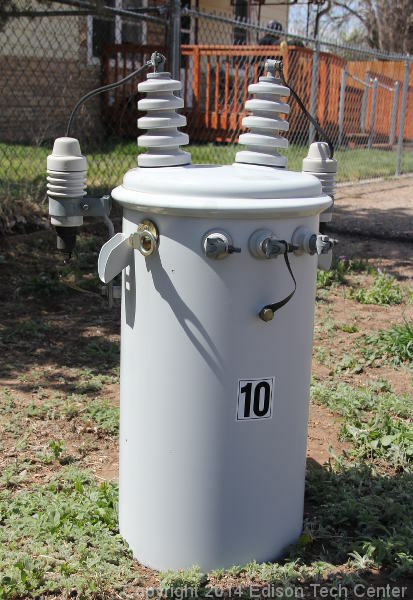 A transformer can be used to convert AC power to DC power. 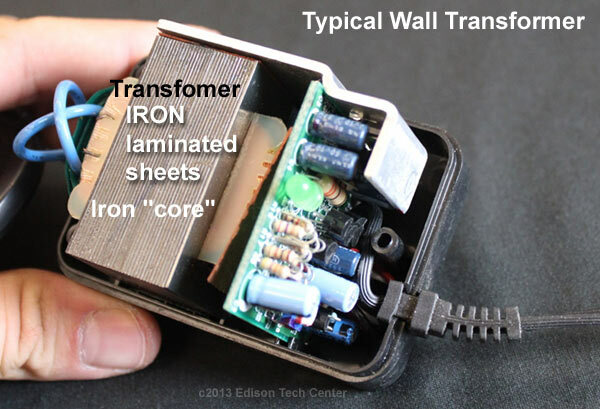 There are transformers all over every house, they are inside the black plastic case which you plug into the wall to recharge your cell phone or other devices. These types are often called "wall warts". They can be very large, as in national utility systems, or it can be very small embedded inside electronics. It is an essential part of all electronics today. Who invented the transformer? 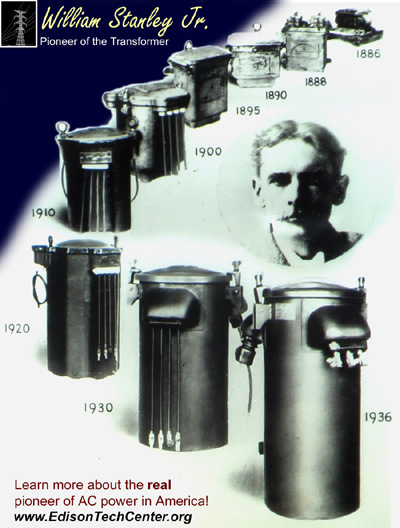 Ottó Bláthy, Miksa Déri, Károly Zipernowsky of the Austro-Hungarian Empire First designed and used the transformer in both experimental, and commercial systems. Later on Lucien Gaulard, Sebstian Ferranti, and William Stanley perfected the design. See the next question for more details. When was the transformer invented? A: The property of induction was discovered in the 1830's but it wasn't until 1886 that William Stanley, working for Westinghouse built the first reliable commercial transformer. His work was built upon some rudimentary designs by the Ganz Company in Hungary (ZBD Transformer 1878), and Lucien Gaulard and John Dixon Gibbs in England. Nikola Tesla did not invent the transformer as some dubious sources have claimed. The Europeans mentioned above did the first work in the field. George Westinghouse, Albert Schmid, Oliver Shallenberger and Stanley made the transformer cheap to produce, and easy to adjust for final use. William Stanley's First Transformer built in 1885. Single phase AC power. 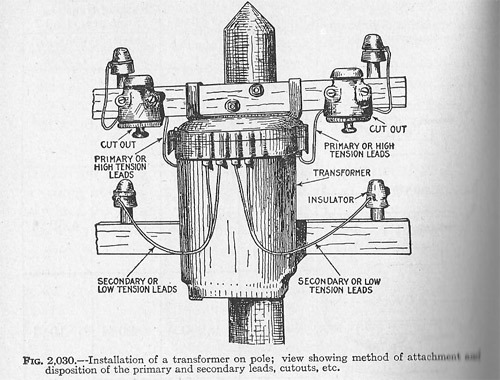 Stanley's first transformer which was used in the electrification of Great Barrington, Massachusetts in 1886. Where were the first transformers used? 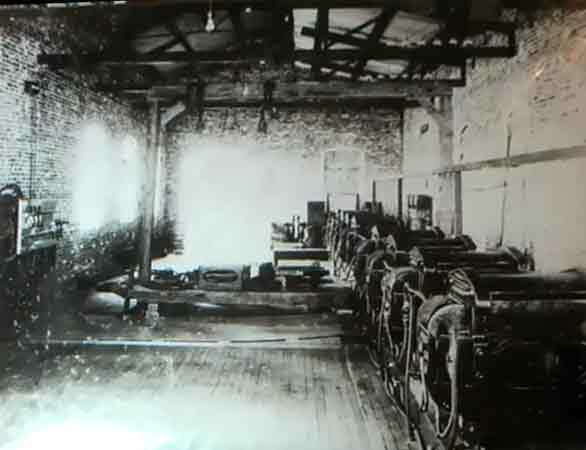 The first AC power system that used the modern transformer was in Great Barrington, Massachusetts in 1886. 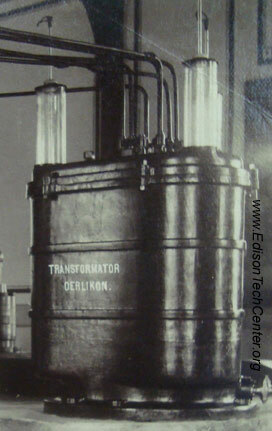 Earlier forms of the transformer were used in Austro-Hungary 1878-1880s and 1882 onward in England. 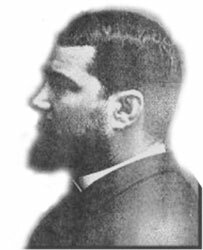 Lucien Gaulard (Frenchman) used his AC system for the revolutionary Lanzo to Turin electrical exposition in 1884 (Northern Italy). 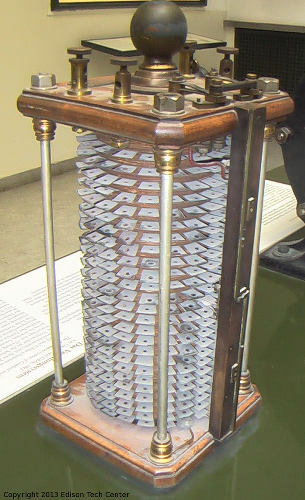 In 1891 mastermind Mikhail Dobrovsky designed and demonstrated his 3 phase transformers in the Electro-Technical Exposition at Frankfurt, Germany. 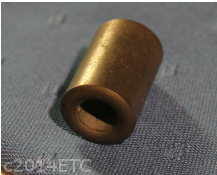 Learn more about the material engineering and importance of IRON. 1830s - Joseph Henry and Michael Faraday work with electromagnets and discover the property of induction independently on separate continents. 1878 -1883 - The Ganz Company (Budapest, Hungary) uses induction coils in their lighting systems with AC incandescent systems. 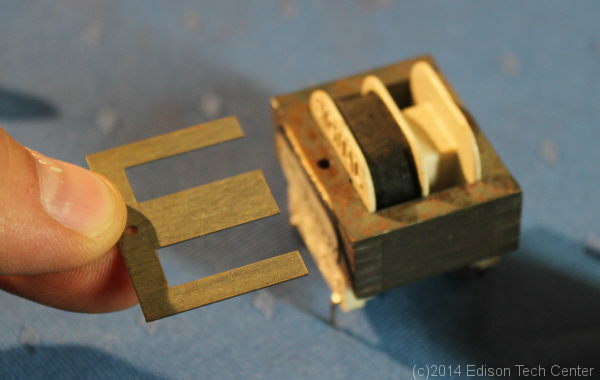 This is the first appearance and use of the toroidal shaped transformer. 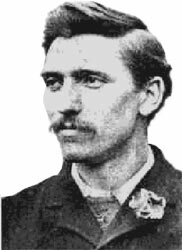 1880-1882 - Sebastian Ziani de Ferranti (English born with an Italian parent) designs one of the earliest AC power systems with William Thomson (Lord Kelvin). He creates an early transformer. Gaulard and Gibbs later design a similar transformer and loose the patent suit in English court to Ferranti. 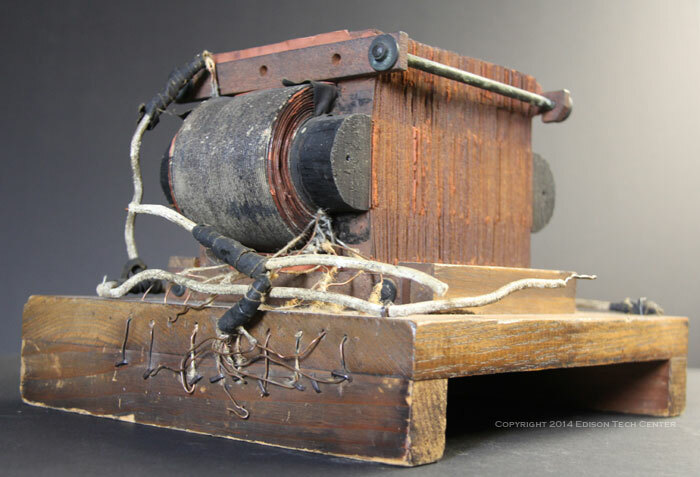 1882 - Lucien Gaulard and John Dixon Gibbs first built a "secondary generator" or in today's terminology a step down transformer which they designed with open iron core, the invention was not very efficient to produce. It had a linear shape which did not work efficiently. It was first used in a public exhibition in Italy in 1884 where the transformer brought down high voltage for use to light incandescent and arc lights. Later they designed a step up transformer. Gaulard (French) was the engineer and Gibbs (English) was the businessman behind the initiative. They sold the patents to Westinghouse. Later they lost rights to the patent when Ferranti (also from England) took them to court. 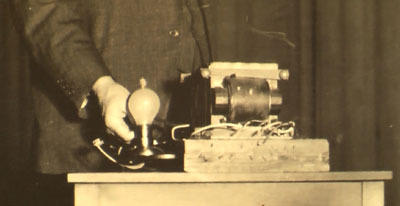 Ottó Bláthy, Miksa Déri, Károly Zipernowsky created the "Z.B.D Transformer"
1884 - In Hungary Ottó Bláthy had suggested the use of closed-cores, Károly Zipernowsky the use of shunt connections, and Miksa Déri had performed the experiments. They found the major flaw of the Gaulard-Gibbs system were successful in making a high voltage circuit work using transformers in parallel. There design was a toroidal shape which made it expensive to make. Wires could not be easily wrapped around it by machine during the manufacturing process. 1884 - Use of Lucien Gaulard's transformer system (a series system) in the first large exposition of AC power in Turin, Italy. This event caught the eye of William Stanley, working for Westinghouse. Westinghouse bought rights to the Gaulard and Gibbs Transformer design. The 25 mile long transmission line illuminated arc lights, incandescent lights, and powered a railway. Gaulard won an award from the Italian government of 10,000 francs. 1885 - George Westinghouse orders a Siemens alternator (AC generator) and a Gaulard and Gibbs transformer. Stanley begin experimenting with this system. 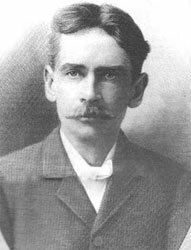 1885 - William Stanley makes the transformer more practical due to some design changes: "Stanley's first patented design was for induction coils with single cores of soft iron and adjustable gaps to regulate the EMF present in the secondary winding. This design was first used commercially in the USA in 1886". William Stanley explains to Franklin L. Pope (advisor to Westinghouse and patent lawyer) that is design was salable and a great improvement. Pope disagrees but Westinghouse decides to trust Stanley anyway. 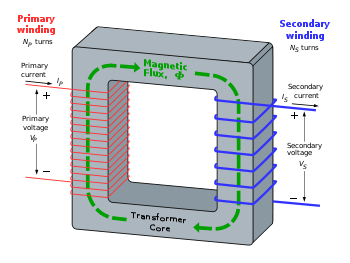 Above: the modern E-core transformer is based on Stanley's design. Iron plates stamped in an E shape can be inserted from both sides of the winding. George Westinghouse and William Stanley create a transformer that is practical to produce (easy to machine and wind in a square shape, making a core of E shaped plates) and comes in both step up and step down variations. George Westinghouse understood that to make AC power systems successful the Gaulard design had to be changed. 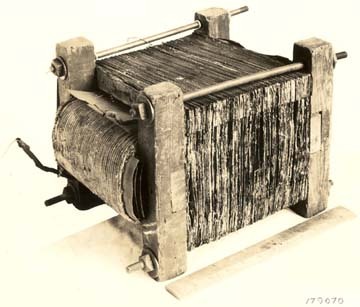 The toroidal transformer used by the Ganz Company in Hungary and Gibbs in England were very expensive to produce (there was no easy way to wind wire around an iron ring without hand labor). 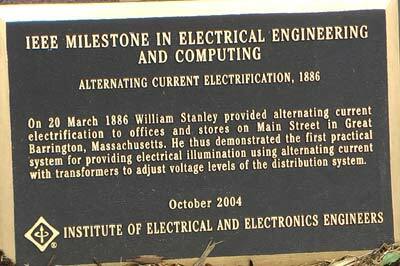 1886 - William Stanley uses his transformers in the electrification of downtown Great Barrington, MA.This was the first demonstration of a full AC power distribution system using step and step down transformers. Later 1880s - Later on Albert Schmid improved Stanley's design, extending the E shaped plates to meet a central projection. 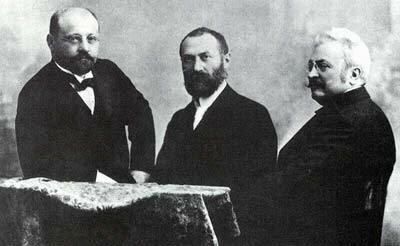 1889 - Russian-born engineer Mikhail Dolivo-Dobrovolsky developed the first three-phase transformer in Germany at AEG. He had developed the first three phase generator one year before. Dobrovolsky used his transformer in the first powerful complete AC system (Alternator + Transformer + Transmission + Transformer + Electric Motors and Lamps) in 1891. 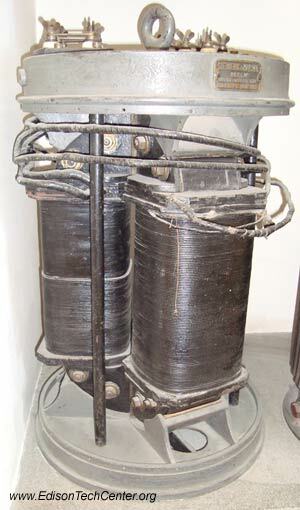 Transformer used on the Lauffen to Frankfurt demonstration line. 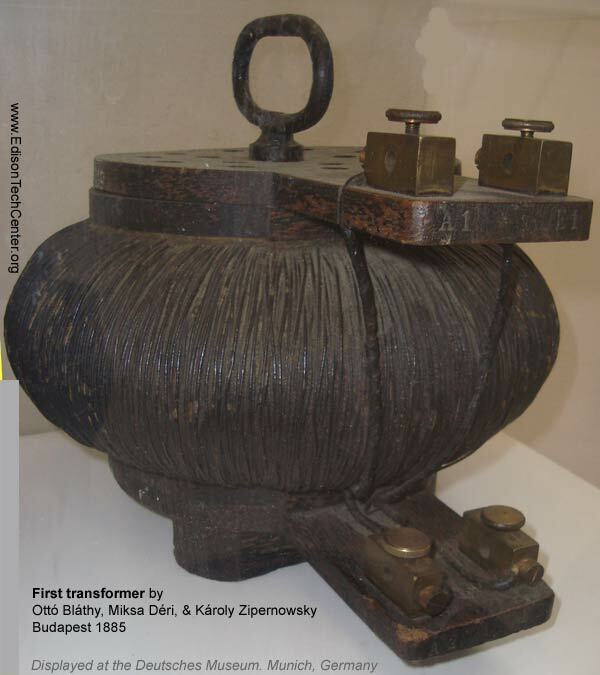 This transformer was created at the beginning of the modern electrical grid, the same year as the Frankfurt Electrical Exhibition which demonstrated long distance transmission of power. 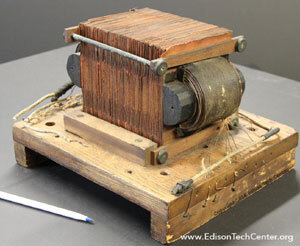 1880s - today - Transformers are improved by increasing efficiency, reducing size, and increasing capacity. The graphic to the left shows the progression and advancement of the transformer over the years. William Stanley once wrote: " I have a very personal affection for a transformer." "It is such a complete and simple solution for a difficult problem. It so puts to shame all mechanical attempts at regulation. It handles with such ease, certainty, and economy vast loads of energy that are instantly given to or taken from it. It is so reliable, strong, and certain." 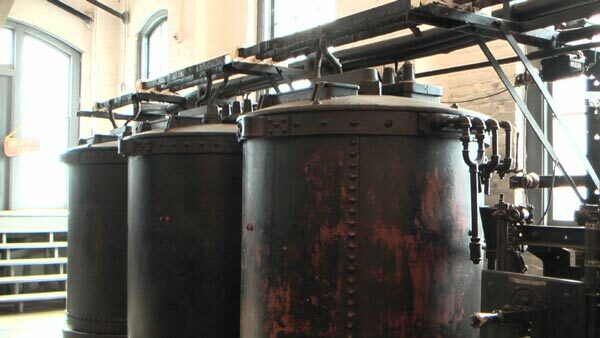 Large Westinghouse transformers from 1917 at the Hydropower plant at Folsom, California. -To transmit over long distance you need high voltage on a skinny wire or low voltage on a wide wire. High voltage on DC is very dangerous, and with low voltage the wire would have to be so thick that it would not be practical. Also with high voltage you couldn't not step down the voltage so it could be used with home light bulbs. Using the water analogy: imagine that a small wire with high voltage is like a garden hose with high pressured water moving fast inside. Imagine that this hose fills 2 gallon jugs of water in one minute. Now think of a 6" wide drain pipe filled with water. You can deliver the same amount of water to the destination in the same time period without needing so much pressure. With AC power you also use high voltage to move the electricity down a long wire. AC becomes more practical because once you send the power to the destination, you can use a transformer to change the voltage down to a manageable level. The power is stepped down several times by the time it reaches you home. The power line coming into your home is at 240 volts, from your breaker box it is split into lines of 120 volts for most of your home sockets and 240 for appliance sockets. In Europe and other regions 220 V is the standard home socket. Transformer - a device that transfers electrical energy from one circuit to another circuit using inductively coupled conductors. In other words by putting two coils of wire close together while not touching, the magnetic field from the first coil called the primary winding effects the other coil (called the secondary coil). This effect is called "inductance". Inductance was discovered by Joseph Henry and Michael Faraday in 1831. Now if you would like to change the voltage on a powerline, you could do this by changing current going into the primary coil (voltage stays high). The current level affects the induced voltage on the secondary coil. A changing magnetic field induces a changing electromagnetic force (EMF) or "voltage". To put it simply: by changing the current you can obtain the desired voltage on the other side. -How a Transformer Works, interview with Lionel Barthold. Video. Edison Tech Center.